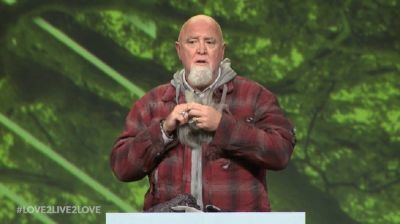 Illinois megachurch Pastor James MacDonald recently disguised himself as a bearded homeless man and camped outside of two Harvest Bible Chapel campuses before Sunday services to see how congregants would react. MacDonald, the founder of the seven-campus Chicagoland area congregation whose "Walk in the Word" radio and television programs are seen by millions worldwide, posted the video of the experiment on his Facebook page Monday. As Christ calls on his followers to help the "least of these" in society, MacDonald wanted to put Harvest Bible Chapel congregations to the test to see how well they are living out the biblical commands to not only love God but also "love your neighbor as yourself." 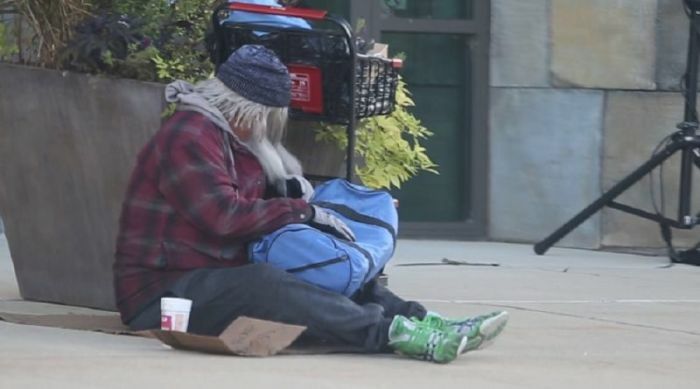 The video starts off showing MacDonald dressed in layers with a fake beard and long gray fake hair as he rolls a shopping cart down the street toward one of the Harvest campuses. MacDonald then takes a seat right in front of the building, putting out a cup for change and a sign. Churchgoers in the video couldn't help but notice the hairy homeless man sitting with his legs crossed by the entrance as they walked by him to enter the church. The beginning scenes of the video show congregants walking right past the homeless MacDonald without offering much in the way of help. Another scene shows the homeless MacDonald sitting outside of another Harvest Bible Chapel campus as churchgoers walk by him to get to their Sunday services. "The closer a person is to us and the less common the struggle, the easier it is to love," MacDonald says in the video. "God forbid I find out my wife has three months to live, I would quit my job and quit everything, right? What if it's just an acquaintance of yours and what if the problem is recurring. ... How common is homelessness? How frequently is the homeless person someone dear to us personally? Never." The video then shows the bearded homeless MacDonald walk through the church sanctuary with his shopping cart. He then walks on stage and begins to take off his beard and layers of clothes to reveal his true identity. "So I took a few moments a couple of weeks ago and camped outside of a couple of our campuses and I wanted to see how we were doing when it is hardest to love," MacDonald told the congregation. "Do you know that your father in Heaven is giving the same graces to the person that is hardest for you to love? He is giving it. He doesn't play favorites. He is giving the grace to everyone. If we are going to love like our father in Heaven loves, we don't get to play favorites. By favorites I mean, so often we love the people when there is some benefit in it for us." MacDonald used the video experiment to make a point during his sermon that Sunday that "it's hardest to love when the problem is most common and the people are least known." "So how did our church do in the video?" he asked. "I am going to tell you now — awesome." MacDonald explained that he was "crying inside that beard" because of the generosity and love shown to him by the congregants who either brought him food or took the time to pray with him. Although the first few scenes of the video showed congregants walking past the homeless MacDonald, the final minutes of the video show the numerous churchgoers who offered him prayer, food, drink, money and even "the Word of God." Others even invited the homeless man into the church to join them in worship. "I dressed up as a homeless man and sat outside our church. What I witnessed blew me away," MacDonald wrote on Facebook. Pastor James MacDonald is an esteemed Bible teacher whose "Walk in the Word" radio and television programs are followed by millions throughout the United States and around the world. He's the Founding and Senior Pastor of Harvest Bible Chapel whose seven campuses are spread throughout the greater Chicagoland area.